Lesson 62: Guardians of the Galaxy Vol. 2 – Gunn’n It! 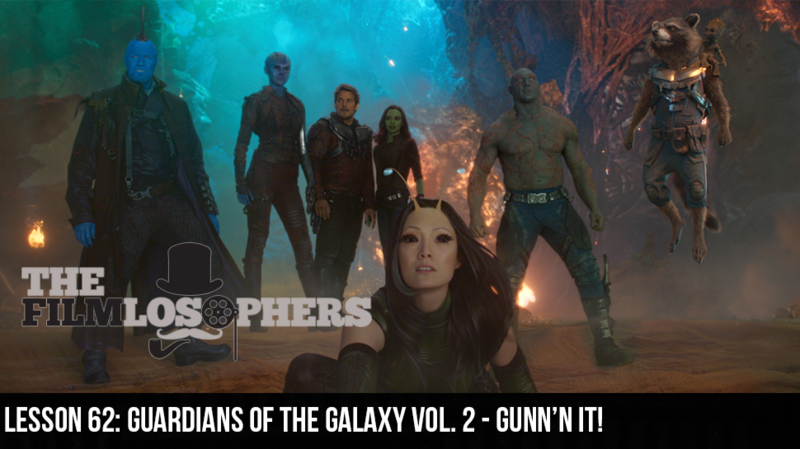 The Filmlosophers, Eddie Villanueva and Chad Riley, welcome back Trenton Brewer and Sacramento cosplayer Marquis Sweat-Keaton to turn on the Walkman and get in the groove on all things Guardians of the Galaxy Volume 2 (2017). With five mid- and post-credit scenes and the presence of both Tango and Cash (Sylvester Stallone and Kurt Russell), there’s a lot to love in this sophomore outing from James Gunn, Chris Pratt, Zoe Saldana, Dave Bautista, Bradley Cooper and Vin Diesel – to the tune of more than $400 million worldwide within its first week of release.